I've always had an affinity for trunks. I can still remember my first coffee table, it was a wicker trunk. I don't know what it is I like so much about trunks. Maybe the idea of travel or the past? I'm not sure, but I really do love them. When we moved we realized our coffee table was way too big for our new family room so the Hubby and I decided we wanted to have a steamer trunk as a coffee table. Try as we might we couldn't find one anywhere that wasn't crazy expensive or a brand new trunk trying to be an old trunk. 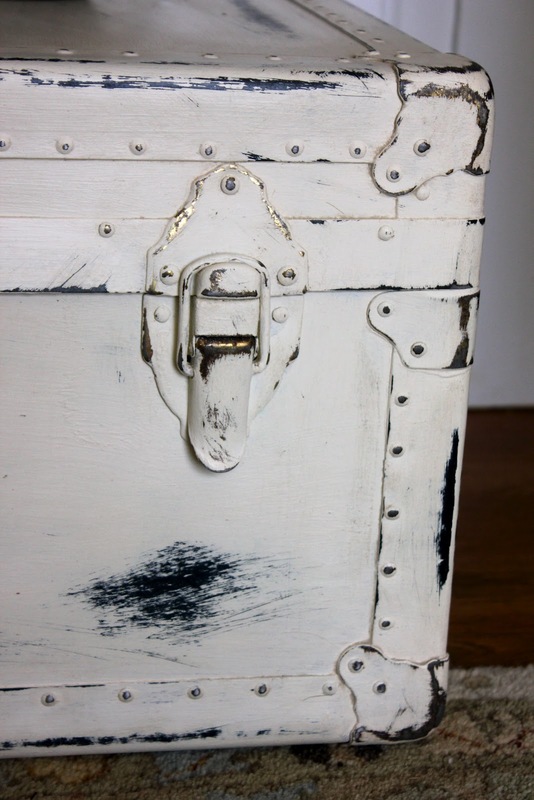 I knew I wanted an OLD trunk with history and character. We went to antique store after antique store and we didn't find a thing. It wasn't meant to be. It worked out perfect for us because as I wrote in a previous post I had a very generous friend give me a beautiful coffee table to redo. Problem solved! Of course when I wasn't looking for a trunk anymore....I found one! It wasn't in very good condition, but I knew I could do something great with it so I bought it. It's been sitting in the garage for a month or so waiting for some attention. Finally I got around to it this week. Here's what it looked like before I got too far along. I have to get better at remembering to take pictures before I start! Here you can see the hardware is a mess. Completely rusted brass plate....nothing I could do to make it prettier. The main lock is also broken. On the far left you can see just how rusted this thing was. Then there are the leather handles that literally disintegrate in your hands when you try to use them. You can see all the gouges and scratches in the body of the chest as well. I'm definitely not storing anything in this trunk. Febreeze really did take all the smells away! Hmmmm......how observant are you? Did you see that in the last 2 pictures the trunk is PAINTED??? This is how it looked with 2 coats of Annie Sloan Chalk Paint in Old White. This paint really does stick to anything! It went on quite well on the metal parts as well as the body of the trunk. 2 coats of paint and a coat of clear Annie Sloan wax and I was ready for another step. One side note on the waxing process for anyone thinking of doing this. Put the wax on with a wax brush and really work it into the paint, but in small sections. This protects the paint and gives it a nice sheen. Yep...I even painted the disintegrating leather handles! Then I used some sand paper and gave it some of it's character back. I wanted it to look it's age....like it's been around the world many times. Here is the end result.....YIPPEE I'm super happy with how it turned out. I love it! I didn't know if I had a place for it, but I found one. I thought I was going to have to sell this one, but I just couldn't do let it go. I adore how the painted hardware turned out. I'm also super excited about how the top turned out. It looks like it's been well-used and loved over the years. This just goes to show that no matter how ugly a piece of furniture might look....there's always something that can be done to bring it back to life and make it pretty again. When my Hubby saw this piece at the store he really didn't see what I could do to it. I worked on it while he was away on a business trip. When he got back and saw the trunk painted, before all the distressing, he couldn't believe the transformation. That's the best compliment a girl can get!! 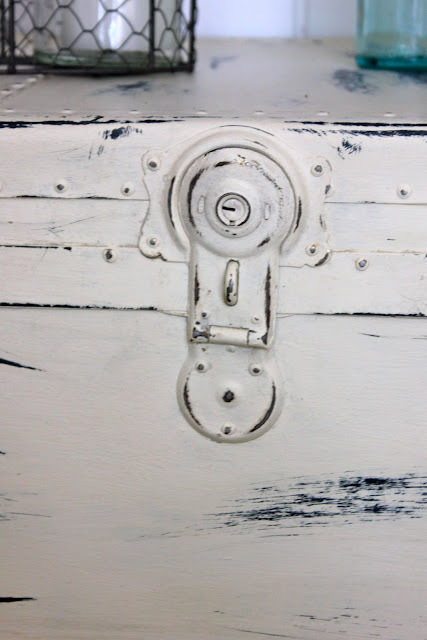 I just purchased a trunk at auction and it's awful. I had no idea what I was bidding on! Of course I won it :) I just went out and purchased my first few cans of ASCP because of that trunk. I'm so grateful I saw this post! I know my trunk will turn out fab, because yours is awesome! I have passed by many a rotten looking trunk at sales thinking they can not be transformed. You prove that thinking wrong! Bought my first trunk at Auction for £30 last week and it is sitting in my workroom/garage waiting to be tackled. Reading through your blog has given me confidence to just get stuck in and commence the transformation. What colour though? Well I've been using ASCP for a very long time and wasn't too pleased with the limited colour range ... mixing up colours isn't my thing because I feel I'll not judge the required quantity for the project then run short and not be able to remix the exact shade!!!! Problem solved: I've found an even better chalk paint, covers more smoothly and professionally, and is available in over 120 different gorgeous colours [16 different colours of green] - it is called AUTENTICO and I am sooooo impressed with it I want others to enjoy the benefits. (*Whispers in a low tone** "Sightly cheaper too than AS"). So my obsession continues. All my spare time is now spent using this fabulous AUTENTICO chalk paint to transform furniture for friends, family and clients. I inherited 3 trunks, one of which looks almost identical as the black you painted. I am looking into repurposing these into something else.. possibly cat beds.. maybe putting hinges on the lids to keep them open to look like headboards... what do you think? Tina, I think that's a great idea actually!!! Go for it!! You can always try one and see what you think. I've seen dog beds made out of old suitcases, so why not a trunk? I'd love to see your finished project! Hi there! Love your trunk. I have two questions: do you think a poly finish would work because Annie Sloan is not available where I'm from and I have no access to those products. I'll be using a homemade chalk paint. Also there are a couple spots rusting out on the actual body of my trunk. Do you think it would be ok if I ainted over them? Shelby, where are you located? 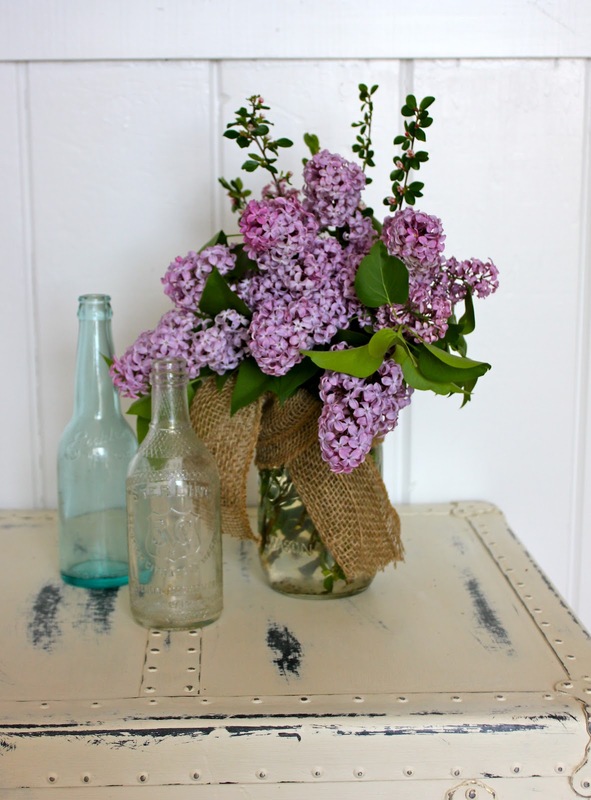 I buy all my Annie Sloan online. I really don't know how the homemade paint will work. The homemade chalk paint is not the same thing because ultimately it's still latex paint. I also had rust spots on my trunk, but I sanded them down and then painted over them. You could always sand them down and use a primer for rust. I just purchased a trunk very similar to your "before" trunk and am planning to redo it. $25 at Goodwill so I can't go wrong although my husband thinks I'm nuts. Thanks for sharing your experience! I'm glad to know that there's hope for my trunk. Great!!! Yes, there's hope for your trunk! I've done a few since that first one a couple years ago and they're a lot of fun. One suggestion, if your trunk smells at all inside, rip out the lining, whether it's fabric or paper, then seal the inside with a couple of coats of shellac. It's very easy and the shellac seals the trunk and no more smells. :-) Good luck and I'd love to see an after pic! It sounds like the trunk you have is similar to the one I had. My trunk didn't bubble when I painted it and definitely felt like what you're describing. The best thing to do is maybe try a spot underneath that isn't noticeable and see how it reacts to the paint. If it bubbles then you know you can't paint the trunk. I've seen a lot of trunks being painted like mine with no one having any problems. 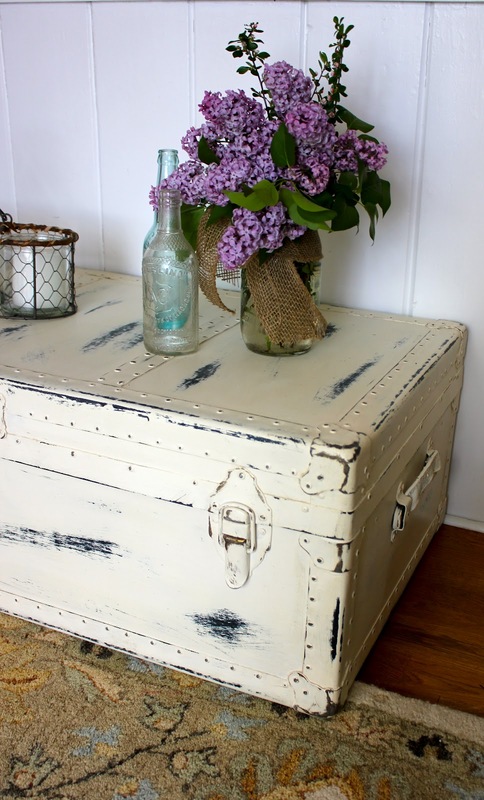 I would suggest using Chalk Paint™ decorative paint by Annie Sloan however. That's what I used and it stuck to everything, including the leather handles very well. Good luck with your project!! Great work! I LOVE how this turned out. 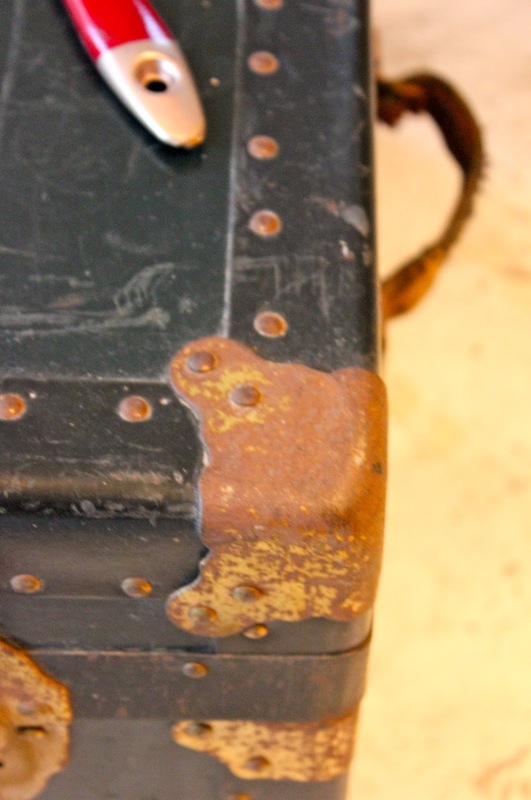 One question: what grit sandpaper did you use for distressing the body of the trunk? I recently bought a 220 grit sandpaper for distressing some projects, but I noticed that it only does well on corners and nooks/crannies, not so well on the smooth body of each project. Would love to know what size grit you used! Hi Sarah, Sorry this was over 2 years ago and I don't remember exactly what I used. I usually buy 120 grit so I'm going to assume that's what I used here. Hope that helps!! 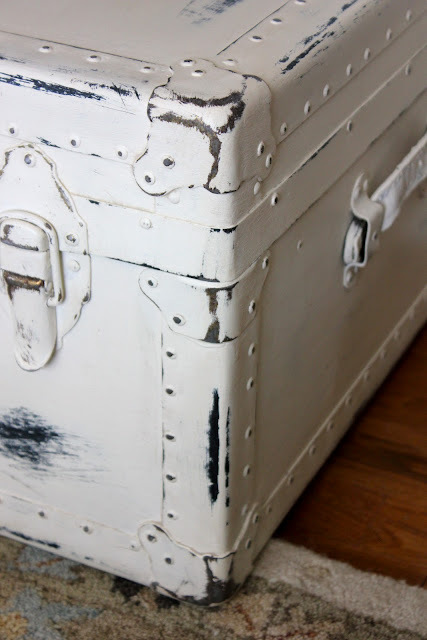 Hi there I too have just come across this great trunk redo! We have a large trunk, holds our games, that I want to paint. However I'm nervous, want to know how you exposed the hardware? I noticed you said you would only use ASCP for this project. Could you explain exactly why? This will be my first attempt at chalk paint and don't want to mess up but I was hoping to do this project soon and did not want to wait to order the paint. Any wisdom and advise you have would be very welcome. I want to do this to a trunk that I've had for years. My husband says we can do this with plain white paint. Can we really or do we really need the white chalk paint? I have the same trunk that was my Dad's military issued trunk. I cleaned up the outside, but didn't paint it. I did however paint the inside. I sanded and scraped all the old paper inside, then did a coat of Kilz paint to get rid of the odor. Then I did 2 coats of chalk paint. I also added legs to the botyom of it. It turned out awesome and now is used as storage and a coffee table.